Participants in the Intertextualité et Humanités Numériques workshop enjoying a moment outdoors at the Fondation Hardt. 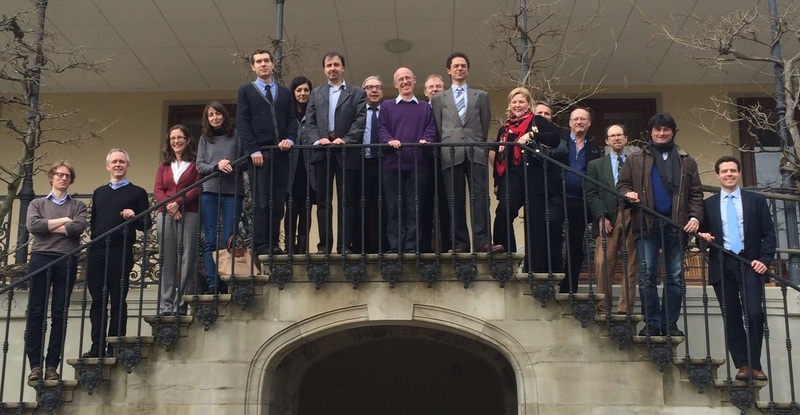 Pictured are (left to right): Yannick Zanetti, Valéry Berlincourt, Lavinia Galli Milic, Chiara Battistella, Christopher Forstall, Martina Mastandrea, Massimo Manca, Paolo Mastandrea, Gregory Hutchinson, Damien Nelis, Neil Bernstein, Monica Berti, Marco Büchler, Michael Dewar, Stephen Wheeler, Cristiano Castelletti, and Neil Coffee. Read the workshop program PROGRAM and see more PICTURES. Participants were asked to give responses in the form of short blog posts, most of which were produced in a dedicated one-hour session at the workshop. You can find these below, along with materials on the research of participants. As I said to more than one person in the course of the workshop, I had expected that I would learn far more than I would be able to contribute. And so it turned out. The presentations of Marco Büchler and Monica Berti, for instance, were a very salutary reminder of the need to frame useful – that is, usefully defined and limited – questions if you are hoping to hope to make sense of what a vast but searchable digital bank of texts has to offer. The presentation of the ‘Musisque Deoque’ team made clear to me how wrong I have been in thinking that I was making good use of their material: in truth, I now know that I had no idea just what, in particular, ‘pede certo’ is capable of. And Paolo Mastandrea has made me a very happy man by providing so much evidence of one particularly fascinating, and largely unexpected, case of the ‘reuse’ of a canonical poet: the idea that Corippus may have had access to a copy of Ennius, and made repeated use of it, was a true revelation. Marco Büchler delivered a presentation on his text reuse research with eTRACES / eTRAP, slides for which are available here. The talk I was to give in Geneva (before weather sadly prevented my arrival) focused on “intertextuality beyond words” — I want to take this blog post to at least partially sketch out what I mean by that somewhat cryptic title. Most approaches to text reuse now, both in the IR world of identifying duplicate or near-duplicate documents, and in more humanistic approaches that explicitly focus on deliberate literary allusions (Lee 2007, Bamman and Crane 2008, Forstall et al. 2011, Büchler et al. 2012, Coffee et al. 2012) treat strings — i.e., sequences of characters, or words — as the atomic unit of comparison. Ovid’s Arma gravi numero violentaque bella parabam // edere is an allusion to Vergil’s Arma virumque cano for having several identical tokens, enclitics and rephrasings (parabam edere <-> cano) that are locally similar at the lexical and phrasal level. Lots of work in text reuse now focuses both on the fundamental problems of 1.) rigorously defining how we judge two things to be similar (an easy question for exact string matching but significantly harder for more distant but semantically similar pairs of text) and 2.) identifying examples of reuse at scale, when N2 brute-force comparisons is simply not feasible (Smith et al. 2013). Les humanités numériques nous invitent à repenser l’intertextualité car elles changent notre rapport au texte antique. À présent qu’il est possible de déceler une masse de points de contact individuels entre deux textes en un clic de souris, le collapse interprétatif guette le philologue qui ne tiendrait pas aussi compte des relations extensives entre les deux textes en question. Mais le risque est moindre par rapport aux nombreux avantages que ces nouveaux outils offrent aux chercheurs, les rapprochant du lecteur ‘idéal’. Taking part in this workshop has been an extraordinary opportunity both to get to know people directly involved in Digital Humanities projects (Tesserae, Musisque Deoque, LOFTS, E-Traces) and better understand the state of the art and what lies ‘behind the scenes’ in terms of technical aspects. I especially appreciated the felicitous combination of more general and theoretical discussion on the issue of intertextuality from a digital standpoint with the illustration of more specific case studies, which have shown how and to what extent Classicists may benefit from DH. Classical scholars will not have to turn all of a sudden into computer scientists, since interpretation will continue to remain key to the field – and this is great news! However, I fully agree that embracing traditional methods and digital tools is what our discipline will ideally need in the near future and what will make it appealing to future generations. As far as the Tesserae project is concerned, I very much look forward to the improvements of the Latin-Greek search tool! Over the course of the past two days, here at the beautiful grounds of the Fondation Hardt, we have been inspired and challenged by diverse new work—both literary and digital—on issues of intertextuality in Classical texts and beyond. In particular, I was thrilled to see the elegance with which the team from Musisque Deoque has combined phonological, metrical and lexical features in their online search tools for Latin poetry. I was also excited by the way in which both digital and non-digital scholars were rethinking the boundaries of intertext, especially with respect the constraints of poetic form and of memory. Not only the ideas, but also the modes of thought and communication have been varied, from traditional close readings to real-time software demonstrations, with lectures and presentations in English, French, and Italian, intense discussions in small breakout groups, relaxed conversations over wine and coffee, and now even ex tempore composition of blog entries. The Intertextuality workshop held at the Fondation Hardt has been particularly helpful to show the importance of digital tools for understanding the phenomenon of intertextuality and getting more results about the relationships among texts. I have particularly appreciated the group discussion on the second day of the workshop, where participants have been able to discuss about the meaning of intertextuality and its application to different texts and different levels of “textuality” within a text and among texts. The workshop has focused the attention of the participants on three main topics that are strictly connected to intertextuality: 1) philology; 2) commentary; and 3) publications. As a book-oriented library scholar interested in the intertextuality of Latin poetry, I found the Geneva workshop on “Intertextuality and Digital Humanities” to be valuable because it has made me more familiar with a new set of research tools in a fast-developing area that has the potential to revolutionize the reading and interpretation of ancient literature for students and scholars alike. In particular, I welcomed the opportunity to hear from the representatives of different digital humanities projects (Tesserae, Musisque Deoque, eTraces, and LOFTS) about the technical aspects of digitization and data analysis. Marco Buechler’s treatment of intertextuality in the corpora of English translations of the Bible referred to a parallel between a source text and a target text as “reuse.” I don’t know where this term comes from, but it may be helpful to distinguish “reuse” from “use.” For example, to talk about the “spoliation” of classical monuments to decorate late antique monuments could be “use” (serving a present need) or “reuse” (a self-conscious reference to the past). For more on the theory of use and reuse, see Richard Brilliant and Dale Kinney, eds. Reuse Value: Spolia and Appropriation in Art and Architecture from Constantine to Sherrie Levine (2011), especially p. 112, where Kinney cites and builds on Anthony Cutler, “Use or Reuse? Theoretical and Practical Attitudes toward Objects in the Early Middle Ages”, in Ideologie e pratiche del reimpiego nell’alto medioevo, Settimane di Studio del Centro ltaliano di Studi sull’Alto Medioevo, 46 (2 vols, Spoleto: Centro ltaliano di Studi sull’Alto Medioevo, 1999), vol. 2, pp. 1055-83.